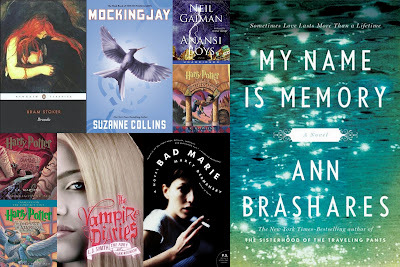 Books: August 2010 [Recap] – my books. my life. Look at that. I almost reviewed everything (ignoring Harry Potter which I will do as one big audio post). I think 9 books might be a new record for me (although if I’d noticed I was so close , I certainly would have tried for double digits). Part of this accomplishment is due to some easy, quick reads (let’s face it, that’s not really an impressive list) but a lot of it has to do with the 4 audiobooks I read. I’ve been flying through the Harry Potter books faster than other audios partly because I simply love Harry Potter and partly because I am finally maximizing my audio time. I’m not just listening in the car anymore. I’m listening when I get ready in the morning, when I’m cooking and cleaning, and when I have a headache and it’s the only thing I can bear to do. You can argue all you want that listening is not the same thing as reading, but I’m finishing MORE BOOKS, people. And that’s something. Think I can hit 10 in September? So, how was your reading month? What was your favorite book? I think you may know more Spanish than me. I got the first HP in Spanish thinking that it would be a good way to brush up since I knew the book so well. I don’t think I made it past the first chapter. I’d love to be able to do it though. The Book Thief has been on my list forever. I really need to actually sit down and read it. I haven’t read The Gargoyle either. I’ll check it out. Thanks for the comment – I love when “real” people stop by. I love that you had such a Potter-filled August! I just finished my reread of the series. Deathly Hallows = SOBS. I’m thinking next time around I’m going to try the audio versions. My favourite book from August was, hands down, Rebecca by Daphne du Maurier. I don’t know why I always look so sad when I comment here – I’m really not, honest. Except that Deathly Hallows thing. I that case, this automated avatar fits perfect. It just needs tear-stained cheeks. Otherwise you get a monster. I don’t know why it always gives you the sad monster though.